The mural at Nether Providence Elementary School was funded by a grant written by art teacher, Cheryl Hendershot . The school focuses heavily on ecology and conservation. We designed the 10medallion shaped mural which shows the four seasons, the water cycle specific to the Delaware Valley, and garden themes. 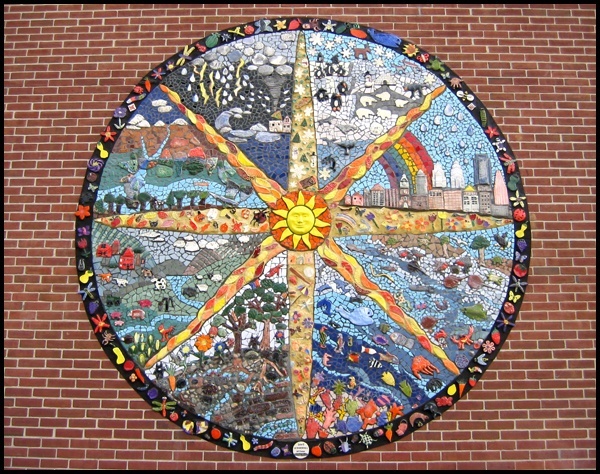 The entire student body of over 300 children contributed tiles to the mural which overlooks the students garden of vegetables and indigenous perennials.